It's been said that the only two things guaranteed to survive the apocalypse are cockroaches and Cher. 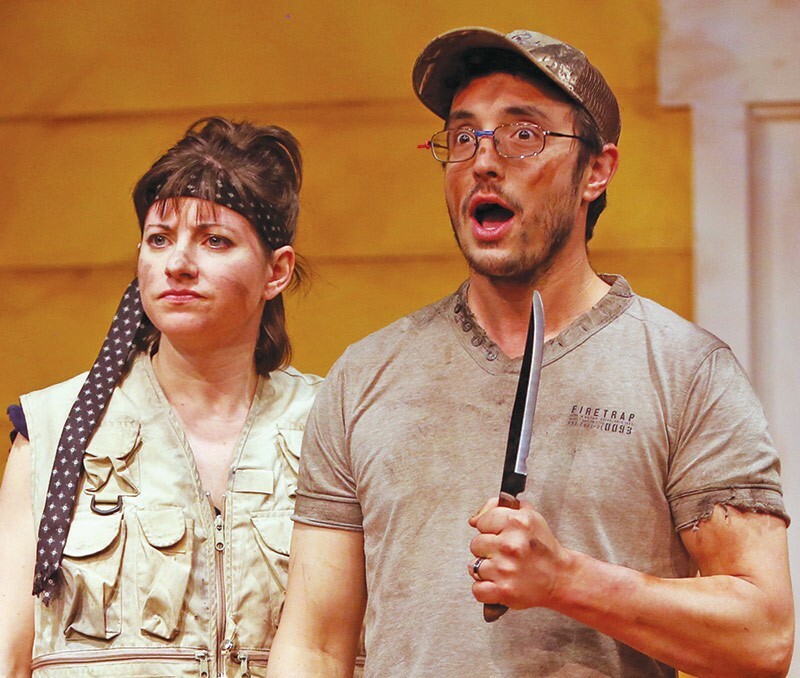 Playwright Matt Lyle would like to add one more thing to that list—barbecue—the setting of his 2014 play Barbecue Apocalypse, running now at the Spreckels Performing Arts Center through April 20. Deb (Jess Headington) and Mike (Sam Coughlin) are getting their backyard deck ready to host some friends. Deb's a little status conscious, hence the decision to host a barbecue as opposed to a sit-down dinner. She's not too thrilled with the beanbag chair in the living room or the movie posters tacked to the wall. The friends they've invited are an odd lot. Ash (Trevor Hoffman) and Lulu (Lyndsey Sivalingam) are yuppie-hipster-foodies, with Ash permanently attached to his phone and Lulu permanently attached to a drink. Win (J. T. Harper) is your basic supply-side economics striver who seems to thrive on putting Mike down. Win's girlfriend Glory (Katie Kelly) is a dancer who's hoping for a successful audition with the Rockettes. Things go south fairly rapidly at the barbecue, followed by things going really south for the rest of the planet. While we never find out the specifics, the first act ends with the end of the world as they know it—and they do not feel fine. The second act takes place at a barbecue one year after the first, and a lot of role reversals have taken place. Deb's become a "female MacGyver," milquetoast Mike has come into his own, the lack of cell phones has forced Ash and Lulu to have an actual relationship, and Win has been reduced to a blubbering mess. Where's Glory? No one's sure. Larry Williams directs this jet-black comedy with a sure hand and has the right ensemble to pull it off. See it before it (or the world) ends.